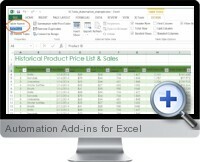 Excel automation add-ins (XLTools) facilitates productivity in Excel with a set of time saving add-ins that automate commonly used data management tasks. Routine operations can be performed much faster with reduced risk of errors through the flexible and high performance automation add-ins provide through the added menu tab. Popup Calendar - automatic population of correct dates and formats by choosing from the calendar. Data Cleansing - batch conversion of data type with cleaning tools including white space removal and case switching. Unpivot Table - transforming multidimensional pivot tables to flat tables for analysis and external system importing. Combine Cells Data - concatenation of adjacent cell content with optional delimiter specification. Sheet Switcher - tools to quickly navigate and switch between worksheet tabs in large and complex workbooks. Repeat Selection - remembers multiple cell selection addresses so that the same selections can be automatically made later. Version Control - stores version information with commentaries with functionality to roll back to previous versions. SQL Queries - utilize the power of SQL query language on Excel data to create complex data mining queries with joins. Mail Merge - create highly dynamic emails from Excel data content and recipient data in Excel. Custom Automation - record repetitive tasks or define within an Excel table for automated execution without requiring any VBA code.